In 30 years of cycling, I spent 24 of them struggling to have a good connection to the pedal. This was in part because of my feet, and in part because cycling footbeds did not exist (or were poorly made) when I started riding. 1989: As a junior rider, I was the kid who had his shoes so tight, the straps were hanging down off the ends of the shoe soles, dangling like spagetti straps in the wind. I don’t have particularly narrow feet, but for the length of foot I have, my feet are extremely low volume (just like the rest of me: skinny). This means that in most conventional cycling shoes, my foot flops around like I am wearing a shoe box. Power transfer is terrible, arch support is non-existent, and proprioceptive input is concentrated to a few square mm of total area. This helped me tremendously but also complicated things, as it further enabled my tendencies towards tinkering and optimization. 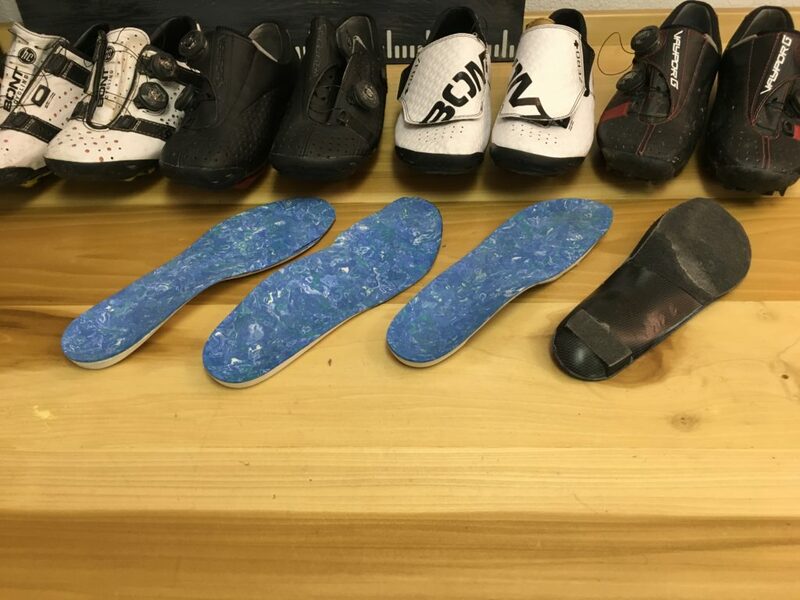 Over the next 15 years I would ride in a dozen different types of custom orthotics including multiple pair from Lamson/D2, multiple castings from Russell Bollig at Podium, a few pairs of E-Soles, R7 with integrated footbeds, and LUST carbon shoes with integrated footbeds. Of all these shoes, the LUST (Light Up Speed Technologies) were the most radical design; they were basically a carbon sock with a cleat attached, and seat belt straps worked as an “upper”. 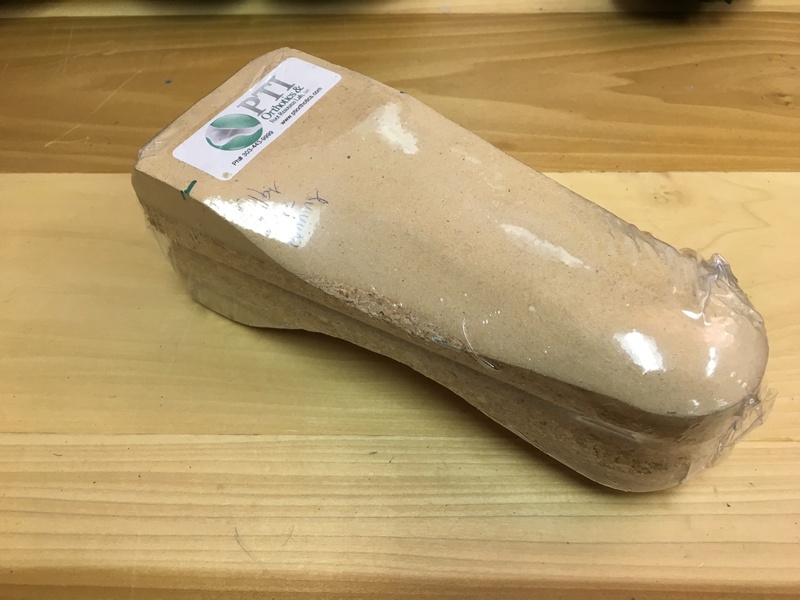 All of the above methods used a lazer scan on a “foot pillow”, a “STS plaster sock” or a foam crushbox method to cast the foot and arch. None of these worked for me, for one primary reason: my foot is way, way too flexible, if it is ever cast with any weight at all, the curve of my arch changed and my foot was no longer held in optimal alignment. The goal of any quality footbed is proper support and the elusive “sub-talar neutral”, which is like petting a unicorn. When this happens, power transfer is automatic and repeatable. On a scale of brick to gumby, I am gumby + 1. I don’t think of this quality in binary terms; it is not “good” or “bad”, life isn’t a Disney movie. It is filled with sliding scales, and in this case I am on the extreme edge of one side of the scale. Any time you are on the extreme edge, there is a price to pay. For me, orthotics have become such a significant piece of equipment that I never travelled to a race without my shoes in my carry on (a cardinal rule for any true professional). If I were to show up to race with shoes, but did not have my footbeds, I would not even bother to start the race. I would be so uncompetitive, there would be no point. The advantage for being extremely flexible is that it allows me to have multiple bikes that have featured on slamthatstem.com. The down side is that when your soft tissue is hyper mobile, it can become a challenge to make force effectively, or control large amounts of force. It also tends to make you an orthotics princess. For all of you who envy my low bars, keep in mind that it doesn’t come for nothing. 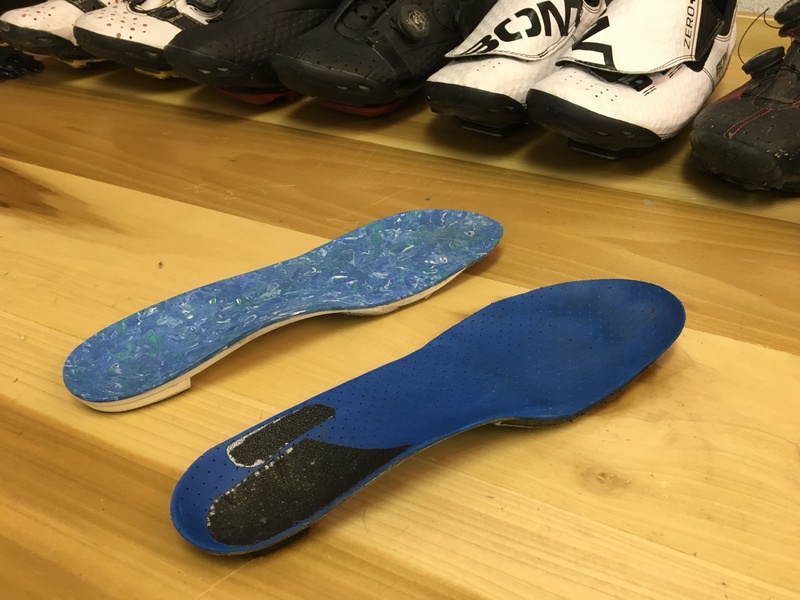 In 2013, Aaron Anderson of PTI Orthotics made me a pair of custom footbeds, and they are the first pair anyone has made for me that has required zero tinkering. I got them on a wednesday and raced them on the weekend, felt great and had my best result ever on a course that normally does not suit my type of riding. It was an extremely good experience and I have been using his footbeds ever since. What is different about Aaron’s methods that made the difference? Aaron uses a completely unweighted scan of the foot to make the shape of the orthotic. The client lays prone and the foot is scanned while it is held in a neutral position. Aaron uses various assessment methods to decide what modifications, if any, are made to the model, which is saves as a file. Once the final shape is determined, a CNC machine makes a positive mold of the foot, from which one or more identical orthosis can be manufactured. Aaron uses your cycling shoes during the process to ensure they fit into the shoe perfectly. In my case, this meant adding a substantial forefoot posting (3 degrees on both sides) to offset forefoot collapse under load. Aaron and I discussed my feet at length and he shared his opinions on the current barefoot running movement…while some athletes may be able to condition their feet to handle the stress of running with minimal or no support, Aaron feels I am definitely beyond that range of functional improvement, regardless of my methods or drive. My ligaments are so mobile, no amount of foot conditioning would help. Aaron can make footbeds for all types of feet, not just dysfunctional cyclists such as myself. The material he uses for the footbeds matches the need of the athlete. If you are interested in visiting Aaron for a consultation, note that he has two offices (one in Boulder, one in Longmont). You can find out more information about how to book an appointment here. You leave the appointment with a CNC cast of your foot, so that you can have multiple pairs of identical footbeds made if required. 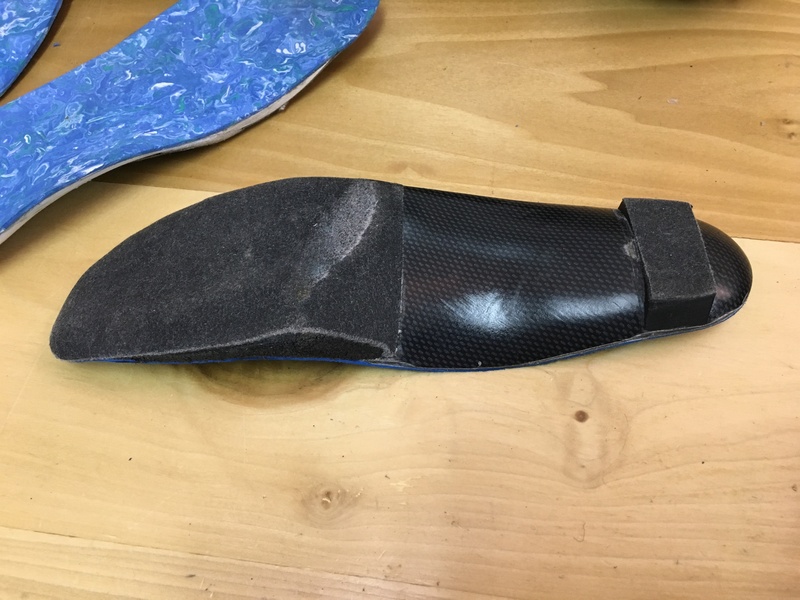 In 2018 Aaron made me a pair of prototype carbon footbeds, which work great for me. I have consistently found that the stiffest platform possible always serves me best in the long run.